How does the Questions from Audience feature work for audience participants? 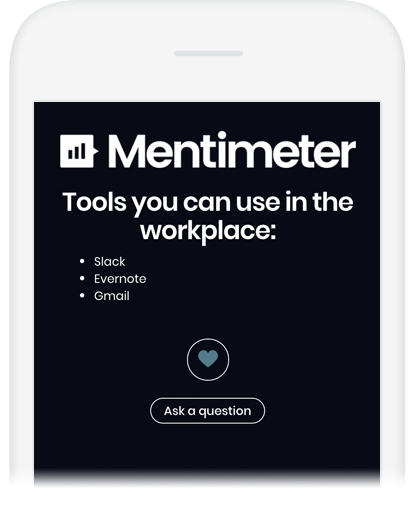 Depending on how you, the presenter, have set up your Mentimeter presentation, there are a couple of different ways that your audience can ask a question during your presentation. Voters can ask as many questions as they like. If you have decided to use a Questions from Audience slide for a dedicated Q&A session, your audience will be able to use their smart device to ask their questions when you are on the Q&A slide. If you have selected the option to enable the Questions from Audience feature for every slide, your audience will see an “Ask a question” button on each slide on their smart device. This means that they can ask a question at any time by selecting the button and submitting their question. You then have the freedom to decide on an appropriate time to answer the questions. 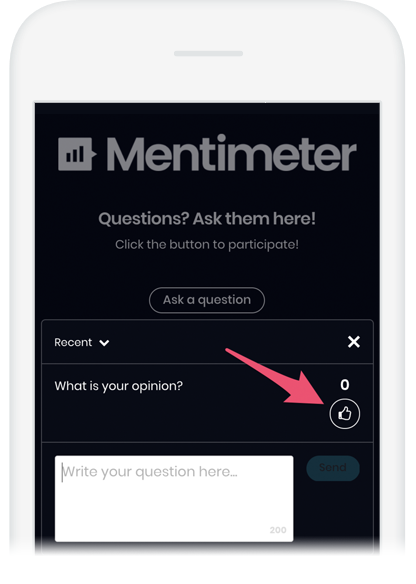 If you have enabled the option which allows the audience to view what questions other audience members have asked, they will also be able to upvote questions they like or want to see answered.